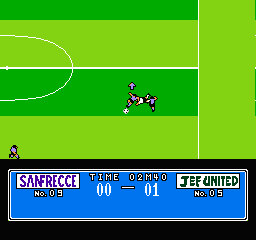 All games in tagged with "Datach - J League Super Top Players"
The Datach (データック, Dētakku) or Datach Joint ROM System, was an add-on accessory by Bandai for the Family Computer and was released on December 29, 1992. It was packaged with one game, Dragon Ball Z: Gekitō Tenkaichi Budokai. Six other games that were released for it, including one of the last games for the Famicom system in 1994. It is one of two mini systems compatible with the NES/Famicom, the other being the Aladdin Deck Enhancer. The Datach consists of a cartridge connection at its bottom, a central cartridge chamber on its back, with two spring-loaded pins on either side, which are pushed up when the unit is inserted into the Famicom, allowing the game to only be removed when the Datach has been removed from the Famicom. Its main feature is the card reading slot on the front. The cartridges resemble half-size Famicom cartridges. One side of the cartridge is flat with title sticker, while the other side is sloped inward with notches on the left and right, which correspond to the spring pins on the main Datach unit. The cards that come with the games are swiped from left to right along the card slot; they are glossy on the front with an image of the character and the backs are smooth usually having the title of the game and barcode. All cartridges, boxes, instructions have the standard FF (Famicom Family) insignia, showing they are officially licensed by Nintendo.